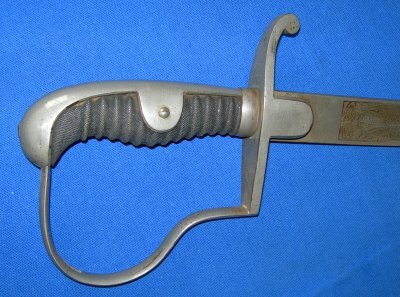 In good to very good overall condition, a blue etched WW1 era German artillery officer's sword. Blue etched to both sides of the blade; depiction of mounted artillery one side, I. Garde Feld Artill. Regt the other. The 34 /14 inch blade is overall in good to very good condition and firm in the hilt, the hilt with plating loss but sound and overall good, the fishskin grip in good condition. 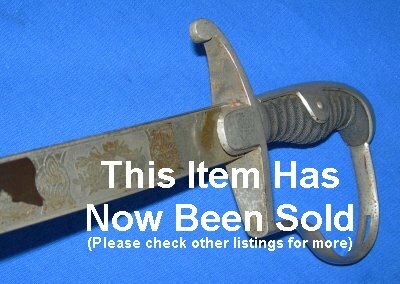 There is no scabbard but it would be worth buying a lesser artillery sword and using the scabbard from that as complete swords in this condition generally sell for over twice what we are asking for the sword alone. A well above average example, grab it quick at only £?. Please quote item reference I55 (1084). Further / full sized images available upon request.